Summary: For a budget Ab roller, you really can’t go wrong with the 66fit model, a best seller on amazon. Very low in price, this dual wheel roller gets the job done with a robust wheel with padded handles. This item has more positive feedback than any other roller, see the product page over at amazon.co.uk and you’ll quickly see why. Abdominal Roller Wheels are an ideal piece of equipment for building strength in both your abs and your back, resulting in a solid core. This item features dual wheels for greater stability, with thick foam handles for added comfort, this comfort enhanced by the foam knee pad. The item is highly portable too compared with other abs and core equipment, small enough to take anywhere, all at an incredibly low price. The 66fit Ab roller has been designed to for great portability, the ergonomic design ensures a premium workout while at just 26cm high, this piece of gym equipment is ideal for storage too. With two easy-glide reels instead of one, you’ll have no wheel wobble during your workout, while the contoured thick foam handles will certainly reduce strain on your hands. The accompanying mat will reduce strain on your knees too, while also being useful for many other exercises without the ab roller. 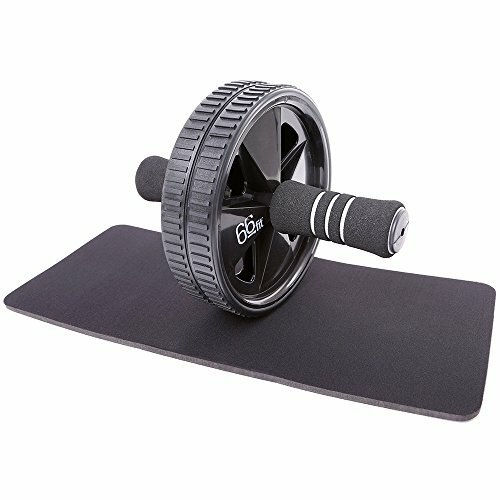 In comparison to other ab rollers, this is certainly reasonable in price. Yes, there are some real budget rollers out there, but the thicker handles and the dual wheel offer a sturdier and higher quality item, and with the mat thrown in too, this offers some very good value for money. Reviews of the item are almost unanimously positive. The wheel is said to be both easy to put together (one reviewer managed this in just 12 seconds!) and take apart if wanting to take it away with you. The roller wheel is said to be ‘incredibly’ sturdy, while ‘Spot on’, ‘brilliant’ and ‘excellent’ were all superlatives stated in the reviews. An ab roller is a straightforward piece of equipment but it can be surprising how the quality differs from wheel to wheel. You’ll have no quality worries with this wheel however; the ergonomic design ensuring an ideal abs workout, while it’s comfortable and stable too. Check it out for yourself at amazon.co.uk!